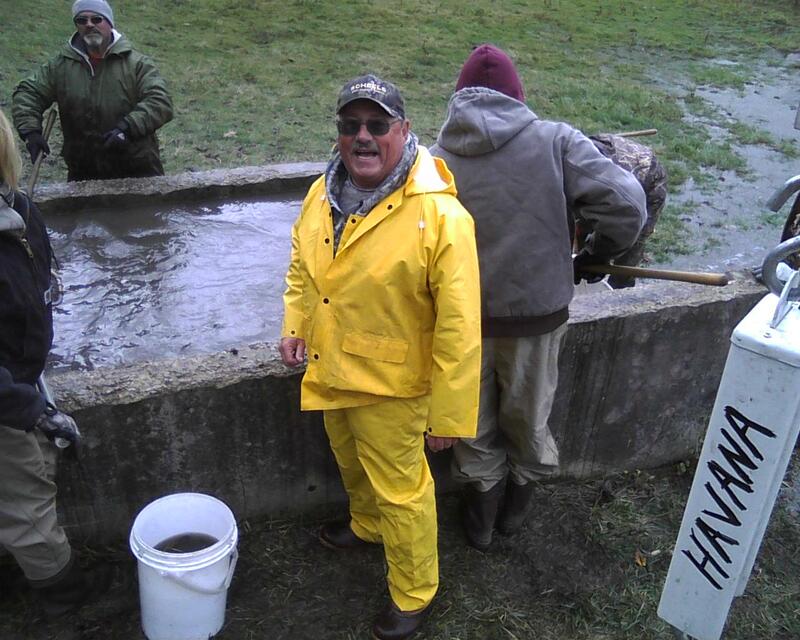 On October 31, 2014 Jerry Jallas of the Springfield Crappie Club volunteered his time to help the DNR collect crappie out of the Schrolls Lake rearing pond. These fish were collected and released into Lake Springfield. Jerry reports they collected 49,275 black crappie with an average length of 4 1/4". Approximately 68% were black nose crappie. They were released into Lake Springfield today. Below are the pictures Jerry shared with us. Thanks Jerry for representing the club and helping support our crappie habitat on Lake Springfield! Applications are now ready to be downloaded on the tournament application page. Sorry for the delays but it was a hectic week for all of us. Fall newsletter should be ready soon to be posted on this page as well so please check back soon. First tournament is going to be September 13th at Lake Shelbyville and is a club event, followed by Sunday September 28th club event on Lake Springfield. Please go to the application page for all the info. This weekend was the event at Mark Twain Lake. Fishing for Freedom Quincy is the name of the event and our club had representation and I want to thank President Barlow, Vice President Henton, and Treasurer Shinn. If I missed anyone please let me know and I will get your name in this post as well. I have 3 pictures to share from Friday and hope to have more as the weekend continues. To view the pics go to our 2014 Pics page. Please go to their site and check it out. Our members can also contact President Barlow at 217- 416-1628 and non members can contact Mindy Goehl at 217-577-5342. One of our members Van Pierceall participated in this event last year and said it was a really great time. Our thanks go out in advance to anyone willing and able to participate that takes the time to help out our veterans! We received disappointing news at our Club event at Mark Twain Lake over the weekend. One of our founding members John Brown has been diagnosed with cancer and will be starting chemotherapy treatment soon. Everyone please put John into your prayers. Rosetta will be mailing out information soon on how to send a card to John. Below is a picture of John at our Mark Twain Event. I was browsing through notes and minutes from prior meetings of years past. I noticed we at 1 time were drawing nearly 40 boats for the Shelbyville open. We have not made it to those numbers for a couple of years. I am open to suggestions and ideas to get those numbers back up so any member or nonmember with ideas or thoughts please contact us on our contact us page and help us out. All suggestions are welcome. Our Lake Springfield Open event had 4 women entered into the competition. This may be an all time record for the club! We even had one of the women catch the Big Fish of the day Jen Montooth with a 1.16# fish great job. This was appropriate lead in to also to wish all mothers a happy mothers day tomorrow and thank you for all you have done as mother! Last spring event is our 2 day event May 17 and 18 at Mark Twain Lake so hurry and get entered for that tourney and end our spring with a big event! 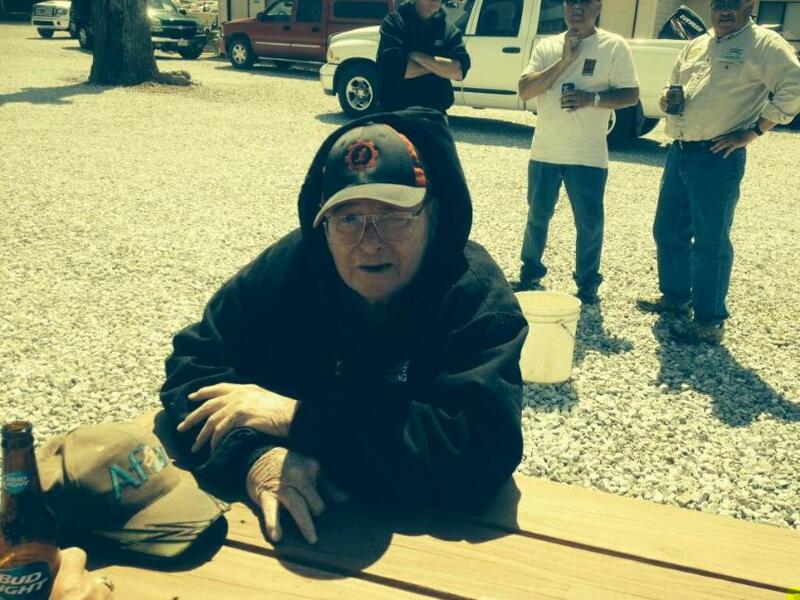 The Springfield Crappie Club Lake Shelbyville Club Event held on April 26th had an unfortunate and unacceptable incident by one of our members. The club offers its sincere apologies to the gentleman that our member was involved with. We also offer our sincere apologies to everyone that was there to see the results and had to witness this incident. This type of behavior cannot be condoned by our club therefore the club has decided to suspend this member indefinitely for his behavior. We would like to encourage everyone to continue fishing our open events and become club members and fish our club events as this type of behavior will not be condoned at our tournaments by our members. Thank you to Carlo Catalano for volunteering to track our raffle tickets and sales. The club truly appreciates those who step up and help and we all pat you on the back for the help. All members really need to make a solid effort to get your tickets sold. Bud York bought his book for $100 and Joe Schrader sold his entire book for $100 and has taken another book to start selling. I hope to have more updates about ticket sales soon. Today we received our raffle tickets for the 1 week stay at South Fork Resorts. We are selling each ticket for $10. We have them in books of 10 and are asking that each club member sell 1 book apiece. Rosetta needs help with tracking the tickets and is still asking for volunteers. I hope a member will come forward and offer their help as Rosetta has her hands full at each event with numerous other things. Anyone that is not a member and would like to inquire on how to purchase these tickets please go to our contact us page and fill out the email request. We ask that any of our members remember how great of a sponsorship gift this is and when booking a vacation over to Mark Twain Lake to book with South Fork Resorts and show your appreciation for this gift. This is a great gift for the club and was a great idea to raise funds to keep the club up and running. More good news for the club as we have gotten another sponsor! Thanks to Robbie Carlson for securing this sponsorship great job Robbie we appreciate your hard work! Welcome aboard to Prarieoutfitters,inc. in Charleston, Illinois. Go visit their facebook page they are trying to get to 300 likes lets put them over the top! Visit them at https://www.facebook.com/pages/Prairie-Outfitters/186319101507059. Excellent news for the club today. New sponsor has joined us and has a very nice gift to be given away at the end of the year. Thanks to Rosetta and Ken for getting South Fork Resort Mark Twain Lake on board with us. South Fork will be donating a 1 week stay at their resort in 2015. That is a $600 donation now that is a top line donation for sure. Thanks goes out to South Fork Resort this is really and above and beyond gift! The club will be doing a raffle for the trip. We will have books of tickets that will be given to each club member to sell. Each ticket will cost $10 and we must sell 400 tickets in order to give this prize away. ALL members please do your part for the club and show your appreciation for our sponsors and get these sold! More details will follow as we get the tickets printed and distributed. Well the beginning of the season has arrived with our kickoff tourney being the Clinton Open in 2 days. We have at last check 20 boats lined up for opening day events. This is better than last years opening event and hopefully that is a sign for bigger and better tournaments the rest of the way! We need to show our support as a club to the following sponsors who have really stepped up to the plate and put in sizable donations for our events. 1.) Brushpilejigs and Thermocline Lures they have created a jig and named it Slab Stingers with S.C.C. green color for our club. They have donated several of these jigs for the open along with donating 3 - $10 Gift Certificates to the first 3 finishers out of the money. I believe we will be seeing more donations in our upcoming spring events from Lee Sharp and Brushpilejigs. Visit them at Brushpilejigs.com. 2. )The Boat Dock and Colman Country Campers. They have donated 2- $25 gift certificates to each of our 6 spring events for a total of $300 of donations. With our support they will be considering doing the same for all of our fall events. So the winners of these certificates please show your support for the sponsor and visit them with the certificates. Visit them at TheBoatDock.com. 3. )Heartland Credit Union. They have donated numerous gifts to the club including blankets, coolers, jumper cables and more. They have donated $300 of product to the club as well so our support needs to be shown as well. We will be giving away one of their gifts at the Lake Springfield Club event. A ticket will be included in your goody bag if you get your application postmarked before Saturday April 5th. Visit them at HCU.org. 4. )Also you will have an entry form for a free guide service in your goody bags for the Clinton Open event. So if you like free guided trips be there and get your entry into the giveaway! Special mention! Rosetta and Ken are working on a great raffle idea with South Fork Resort at Mark Twain Lake it will be an awesome giveaway prize if it all comes through so stay tuned for further details on that! Thanks goes out to club members Ken Barlow, John Henton, and Jim Mumford. Today was the Christmas tree drop at Lake Shelbyville. Here are a few pictures they shared with us. This was a good community service project for the club to be involved with and hope in the future we can do more of these. 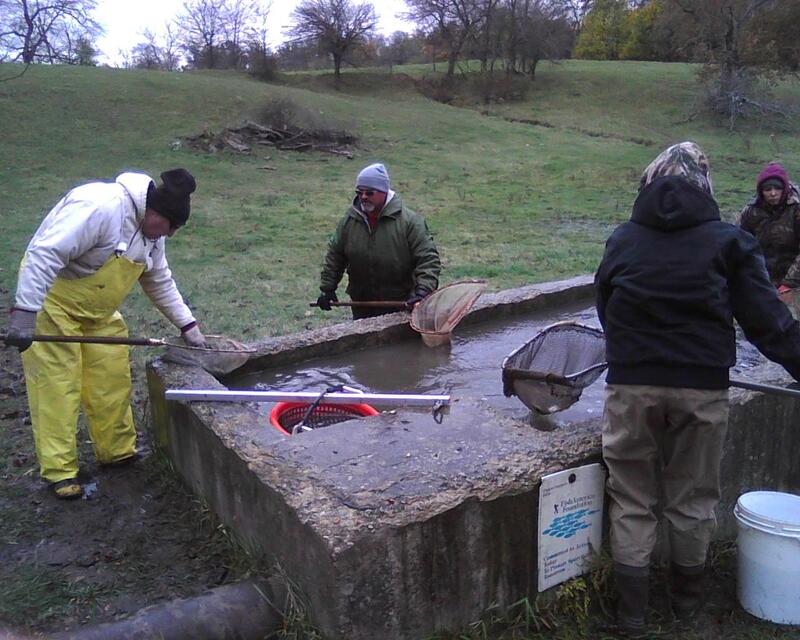 Great job guys for volunteering your time to help the fishing habitat at Lake Shelbyville! Lots of news coming in today! Special thanks goes out to club member Mike Gorsage. Mike took care of all of our trailer repairs, put on new tires, and washed it up. Great job Mike we need more guys like you! We also have a new member. Jan Curry joined the club within the last few days. Welcome aboard and we hope to see you soon at one of our meetings or one of our events! We have 3 more sponsors added to our home page today. We welcome Lee Sharp owner of Brush Pile Jigs. He has partnered with Thermocline Lures and donated enough jigs to give to 30 boats at the Clinton Open Tournament on April 5, 2014. He has a YouTube video posted on our timeline on our facebook page telling you about the new color for the "Springfield Crappie Club" jig. Thanks to Lee and Thermocline Lures for your kind donations and welcome aboard! We also got a commitment from SchadeyCreekLures at Schadeycreekoutdoors.com for some more product at one of our upcoming Spring events. This will be the 2nd year that Schadeycreeklures has made a donation to the club. We appreciate your kindness with the donations and welcome you aboard our site! CLICK ON THE BLUE LINK TO THE RIGHT TO VIEW OUR SPRING MEETING SPRING NEWSLETTER. The Track Shack and owner Joe Jannazzo at 233 East Laurel Street Springfield, Illinois 217-522-0444. Also owned by Joe Jannazzo Onofrio's 2415 Manchester Dr, Springfield, Illinois 217-787-2990. Thanks and welcome aboard! We also have Landmark Auto Group sales consultant Walt Skube aboard. Landmark is located on 2401 Prarie Crossing Springfield, Illinois 217-862-5200. Thanks and welcome aboard! There has been some other interest shown on our facebook page for some donations of tackle and another commitment from Darin Clements for a guide trip on Lake Anna in Virginia. One of our members will be heading out soon for his trip he won during last seasons giveaway from Darin. We were excited to hear that John Pajak has shown interest in giving away a trip to Reelfoot in Tennessee and look forward to that commitment. Hope to hear from all of these guys soon so we can get them posted up on our website. Thanks to all who have responded we truly do appreciate it! Lake Shelbyville - The Fish Habitat Improvement Day scheduled for Saturday, March 8, 2014, has been postponed due to unseasonably thick ice still covering most of Lake Shelbyville. It has been rescheduled for Saturday, March 22, 2014. Volunteer registration begins at 8:30 a.m. at the Lithia Springs Boat Ramp Parking Lot and the work wi...ll begin at 9:00 a.m. Following the event, a free lunch is available for work day volunteers at the Lake Shelbyville Visitor Center. Once again, volunteers are welcome to bring pontoon boats as well as jon boats. The artificial fish attractors are approximately 5 feet in diameter and are more easily transported on a pontoon boat. If there is a shortage of boats, it will slow down placement of the structures. Anyone interested in volunteering their boat is advised to contact Park Ranger Tyler Goble at (217) 774-3951, ext. 7019 before the work day for planning purposes. All volunteers will receive aerial maps with coordinates detailing where the trees were placed for later fishing reference. Maps will not be supplied to the general public, so if you would like one, come join us for Fish Habitat Improvement Day! The U.S. Army Corps of Engineers at Lake Shelbyville greatly appreciates lake patrons and surrounding communities for their support of this project and apologizes for any inconvenience with postponement. 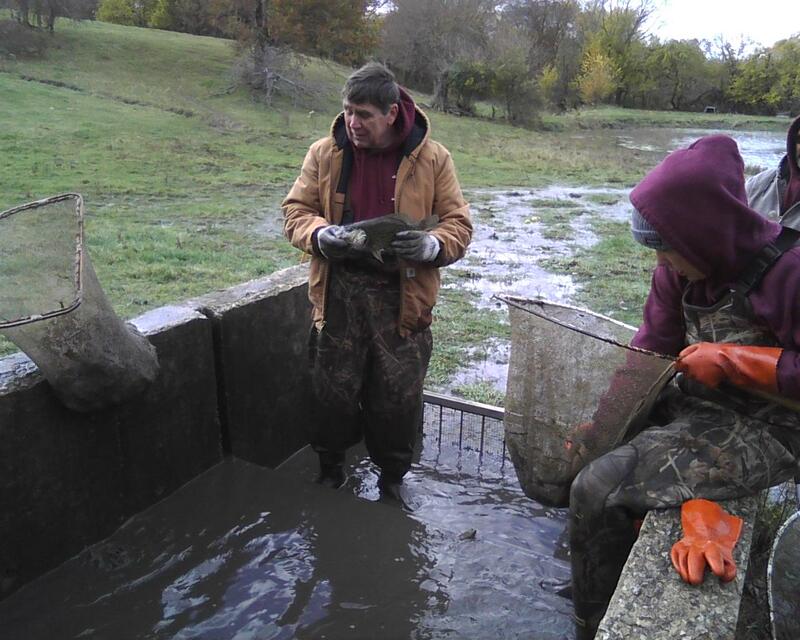 For more information on this fish habitat project, contact Park Ranger Tyler Goble at (217) 774-3951, ext. 7019 or IDNR Fisheries Biologist Mike Mounce at (217) 345-2420. During the month of February we have gotten commitments from 2 new sponsors. The first commitment brought to us by Robbie Carlson is Chips's Marine Sales-Servce Bait and Tackle Shop at 1068 CR 1025 N. Sullivan Illinois 217 728-2610. If memory serves me right this is the shop right at Bo-Woods access area. Thanks goes to Robbie and Chip's thanks for your support. The next to join is Stuller Inc. Franchisee of Steak n Shake with 4 locations in Springfield and 1 in Jacksonville. This commitment was brought to us by Joe Schrader. Thanks goes out to Stuller Inc. and Joe Schrader thanks for your support. On January 26, 2014 the club held its 1st of 2 meetings for the year to select our club and open events. These are all posted under the tournament applications link. There was also many other topics discussed at the meeting. We discussed changing the format of club events to paying top 4 finishers, Lake Shelbyville and Mark Twain Lakes you can now use 3 poles each with 2 hook limits on each pole, and various discussions on how to eliminate excessive costs and raise more money to keep the club in good financial standing.